We are very pleased announce that Christopher Gaillard has joined the Compound Editions team! Christopher Gaillard is an art consultant and appraiser based in New York. Prior to establishing his own business, Mr. Gaillard was Vice President and Head of Contemporary Prints at Sotheby's New York, and was responsible for record-breaking auctions, including the Kenneth Tyler and Tyler Graphics Collection of Contemporary Prints, which is the most successful single-owner auction of post-war prints to date. Mr. Gaillard was also responsible for establishing the world record auction price for post-war prints, when Barnett Newman's 18 Cantos sold at Sotheby's for over $2 million in May 2008. Mr. Gaillard is a board member of the International Print Center of New York, and Momenta Art in Brooklyn. He is also an auctioneer, and regularly presides over charity auctions throughout the United States. Compound Editions is very pleased to announce the release of our fourth multiple, Vessel for Safekeeping (Survivalism), by New York-based artist Susan Graham. 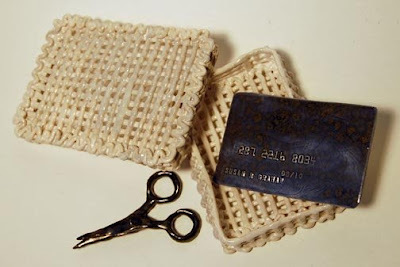 Each piece is a hand-sculpted and hand-glazed porcelain lacy box containing miniature scissors and a credit card. The box is glazed a smoky white, and the scissors and credit card have pewter and blue glazes. All of the pieces have variations due to the fact that they were each made individually by hand and that the firing process is organic. 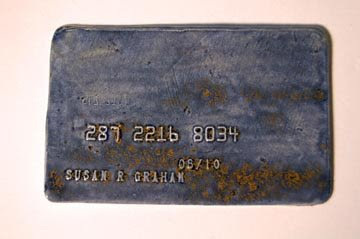 While the edition was inspired by the idea of erasure, the piece Graham ended up making is an enduring representation of financial identity. 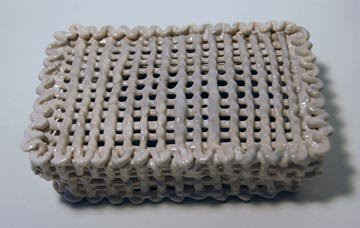 Susan Graham has been included in numerous exhibitions in the United States and Europe including recent shows at the Tucson Museum Of Art, John Michael Kohler Arts Center in Sheboygan, Michigan; the Hudson River Museum in Yonkers, the Sherman Gallery at Boston University, Hunter College Leubsdorf Gallery, New York; the Musee d'art et d'industrie de Saint-Etienne, and the Musee International des Arts Modestes, Sete, France.